Background: Fluoropyrimidines remain the cornerstone of several regimens for solid malignancies, despite their administration may result in severe or fatal toxicities. Objective: To review pharmacokinetic markers predictive of fluoropyrimidine- associated toxicities. Shifting from i.v. boluses to both continuous infusions of 5-fluorouracil (5-FU) and oral prodrugs, as well as capecitabine, significantly increased the treatment tolerability. However, a variable percentage of patients still suffer from toxic effects that require the delay of next chemotherapeutic cycles, their definitive discontinuation, or urgent life support because of life-threatening adverse reactions. Methods: Appropriate and pertinent articles were retrieved through PubMed search. 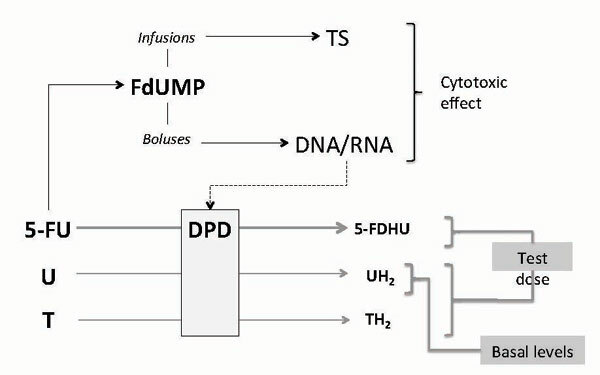 Results: Fluoropyrimidine-associated toxicities are mainly due to a dihydropyrimidine dehydrogenase enzymatic deficiency, leading to a reduced excretion of the drug, its increased activation and increased toxic effects against healthy tissues. Among the pharmacokinetic tests, test doses of 5-FU, uracil and thymine have been evaluated in clinical trials, as well as the measurement of uracil (U) and dihydrouracil (UH2) plasma concentrations. The therapeutic monitoring of 5-FU concentrations during i.v. infusions is another tool to optimize drug dosage before the occurrence of toxicities. Advances in technical platforms, as well as chromatography coupled with mass spectrometry, have simplified the implementation of those tests in clinical routine. Conclusion: Several studies have demonstrated that it is possible to predict the occurrence of severe toxicities from fluoropyrimidines, and the review will discuss all those pharmacokinetic approaches. 5-fluorouracil, fluoropyrimidines, pharmacokinetics, test dose, therapeutic drug monitoring, toxicity.